In March 2016, twenty students and ten teachers from six lucky schools set off with Historical Association staff to the battlefields of France for a fully-funded visit as part of our Agincourt 600 funded projects. 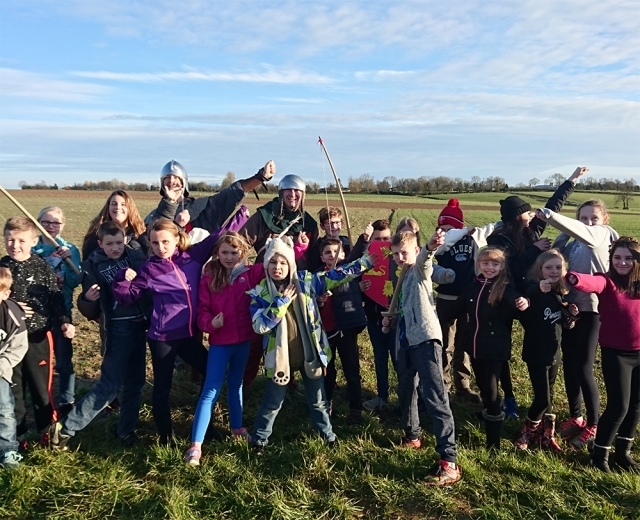 The theme of the visit was ‘Do they learn about Agincourt in France?’ Over the course of the four-day trip, we visited a local French school, re-enacted Henry V’s journey at the Medieval Centre, made our own heraldic shields, practised some archery, stepped onto the battlefield itself – and much more! In the attached article from the most recent edition of Primary History, you can read recollections of the trip from a teacher’s and a pupil’s perspective. It includes tips on how to make use of the HA’s cross-curricular Remembering Agincourt enquiry, which is available for all teachers to use and download. You can also read the Rayburn Tours blog about the trip here.